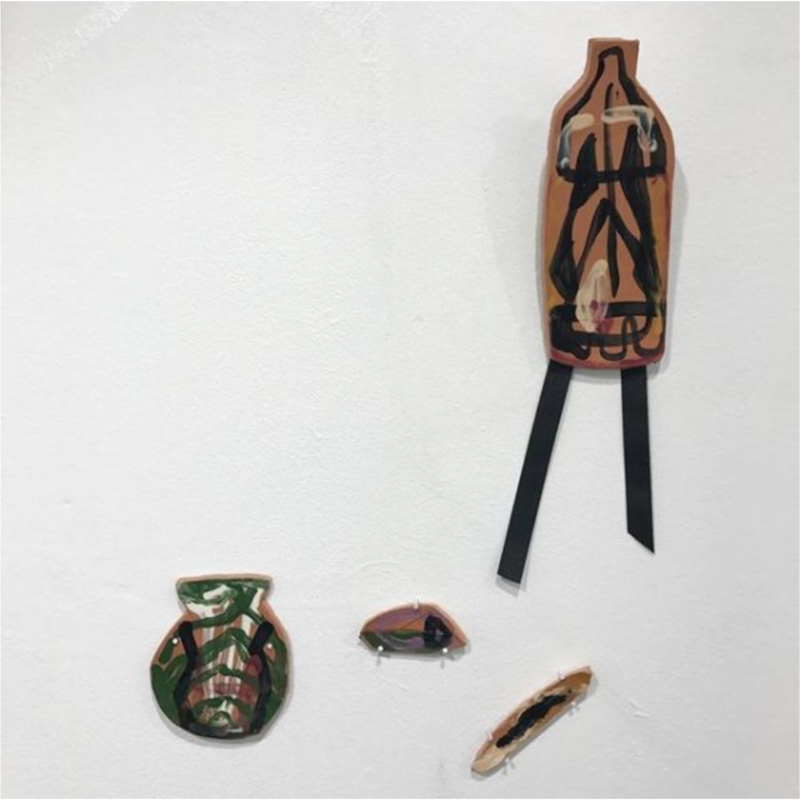 Contemporary artist Padma Rajendran’s debut solo exhibition, Among Nines, just closed at Ortega y Gasset Projects in Brooklyn, New York. Born in Malaysia, raised in the Middle East and America, and now based in New York, Rajendran explores the labor of women, interiors, the meaning of space, and narratives of home in her work. Art advisor Sarah Burney sat down with Rajendran to chat about her work and inspiration. Congratulations on just completing your debut solo exhibition! There were so many things happening in your show: painted fabric, glazed terracotta sculptures, zig-zagging floor cushions, large wood sculptures, and mandatory pom-pom adorned shoe-covers! It was very intense to create that work and think about all of those different moving parts. But I’ve been thinking about these elements for a long time and it was very satisfying to finally execute them, to step into this territory. Now I can build upon these ideas and move forward. So were each of these elements already in your studio/practice and brought together for the show or was everything specifically created for the show with this space in mind? A mix [of both]. Over the past couple of years, it’s been increasingly important for me to make art for a space, to activate the space, and not solely create work that inhabits a space. When planning this exhibition I was very conscious of how bodies would be interacting in this interior. In a traditional gallery show the artwork is on the walls, which is essentially the margins of the room, the periphery. I want to explore what is at the center, to activate the center of the room. At the same time I’m thinking about the whole space, about creating an interior and provide the comfort of a domestic dwelling. I’m trying to conjure the idea of intimate space for everyone. I loved the shoe-covers we were all given as we entered the gallery. 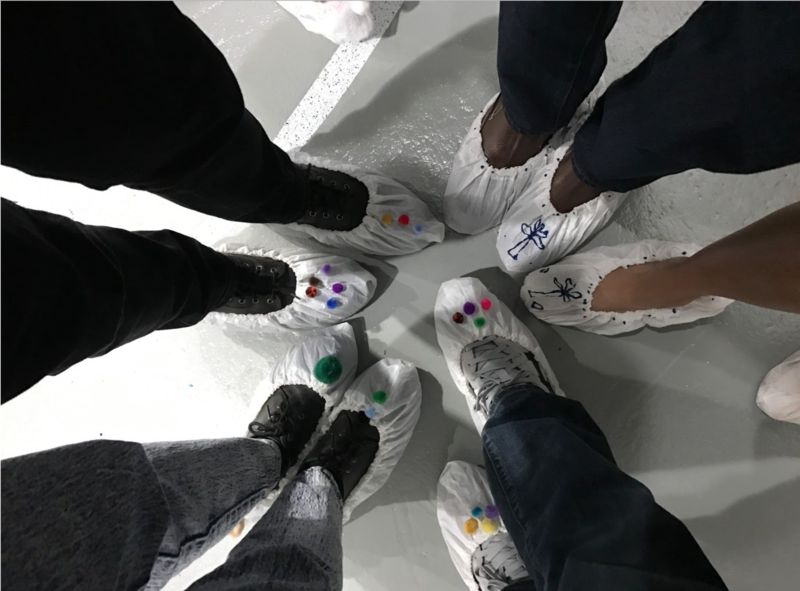 You decorated each shoe cover by hand–why go through that trouble? I love the ritual of gifts, and it became important to offer something to people as they entered. Putting on the shoe covers acknowledges entrance into a new space, it separates the gallery from the outside world. Even if I didn’t have a floor piece I would have considered visitors to wear shoe covers. Since I did it was important to me that people not be concerned with the dirt on their feet or potentially damage the work. Personally, when I have shoes on, I find it limiting in how I sit or get comfortable. I want everyone to be comfortable as they interact with the work. Why make cushions, why not paint the floor? The past few years I’ve been really engaged with working with fabric; thinking about the purpose of fabric and it’s different iterations within the home, within interior spaces. Clothing, tapestries, carpets, all of these textiles tell us where bodies can rest, by their nature they are referencing the body. So these cushions and felt pieces were both a place for visitors to rest and a way to occupy that central space of the gallery. Their curving shape seeks to evoke the moving water of a river and the overall form creates three hourglass shapes. Is that why we see so many vessels in this space? The vessel first appeared in my work in grad school. I’m curious about the many association the vessel shape carries; the vessel as trophy, the vessel as water collector, the vessel as ritual. I think a lot about water; we consume it, it’s part of cleaning, cleansing, like fabric, it acknowledges the body in so many ways. And the vessel is central to our experience with water; it’s central to the ritual of collecting. There are so many things that fill a vessel. Sometimes it is only seen as holding one thing. As if its purpose is singular, because of this I also connect the vessel as a stand in for the female body. Speaking of textiles, the imagery in your hanging textiles is so diverse…columns, buildings, jeans, shells, the statue of liberty, forks, knives, food, brooms, rivers, a dosa with chutneys…what’s going on there? Textiles have always had a narrative element and these are acting as Story cloths. I’m thinking about migration, shelter, the interior, ritual, water, the domestic. The column is a symbol of civilization, specifically linked to the Greco-Roman civilization and western civilization. You see it throughout history but it’s also present in our contemporary American life, look at our “buildings of knowledge”: libraries, judicial, and academic buildings. The column is an architectural support structure. However you can’t escape the phallic symbolism of the column, it supports the patriarchy, it symbolizes the west. There’s a lot of Americana imagery, like the jeans or the statue of liberty, that speak to the international idea of “America” or west. But that’s not the only migration I’m referencing – I think a lot about migration in search of water, when I was a young adult my grandparents moved from city in India to another, because of a lack of water, it’s not such an antiquated or primitive idea, and we’ll probably have to experience it soon within our lifetime. I’m constantly thinking about what is lost in migration or what I am trying not to lose; the dosa and chutneys might not be recognizable to everyone but the function of food is an important part of my narrative. I’m also thinking a lot about women’s work. Specifically how women’s labour is not acknowledged and how history fails us. Historically, most traces of women’s work doesn’t last. The archaeological findings of tools and weapons last because they are made from materials of the earth like metal, but the objects from the female hand: textiles, food, the interior dwellings disintegrate. What’s more, what women create is often meant to be consumed and used by the body so there isn’t something left to preserve. It makes me question, whose presence has more function? The labour of the female doesn’t get it’s due credit. Exploring more ideas of behind the Soft, engaging the floor further, and getting back to some print related work. I hope to complete some work at an upcoming residency early next year at the Studios at Mass MoCA.